The RivLite hand-held battery powered tool was developed for situations where complete portability is required, such as field applications or on-site repair. The tool features a modular design, which allows interchangeable tooling options such as C-frames of different sizes, noses for 3mm or 5mm diameter rivets and a special nose for setting threaded self-pierce studs. A rivet removal tool is also available to facilitate repairs such as the replacement of panels in a vehicle. 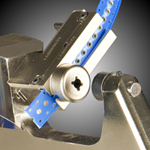 Rivets in tape are manually indexed into the nose and a simple trigger switch sets the rivet. 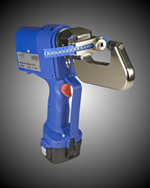 The RivLite high force actuator is capable of installing Henrob's full range of rivets. Its handle can be positioned in 4 places, and the C-frame can rotate 360 degrees. For more information on ordering RivLite kits and spares, please go through Ford's OneRotunda.com website under "Collision" and "Ford Approved Aluminum Collision." Cassettes can be ordered through your local Ford dealer.